the orchid Rhynchostylis gigantea (Lindl.) Ridl. From Proto-Tai *ɟaːŋᶜ (“elephant”), from Middle Chinese 象 (MC zɨɐŋX, “elephant”). Cognate with Northern Thai ᨩ᩶ᩣ᩠ᨦ, Isan ซ่าง, Lao ຊ້າງ (sāng), Lü ᦋᦱᧂᧉ (tsaang2), Tai Dam ꪋ꫁ꪱꪉ, Shan ၸၢင်ႉ (tsâ̰ang), Tai Nüa ᥓᥣᥒᥳ (tsaang5), Ahom 𑜋𑜂𑜫 (chang), Zhuang ciengh, Saek ซาง. Male elephants are called พลาย (plaai); and female, พัง (pang). (slang) great (in importance, size, amount, number, degree, etc). 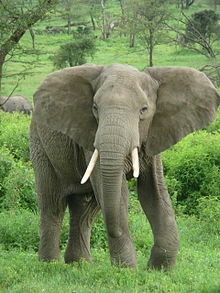 Classifier for elephants registered by the government. (botany) foxtail orchid: the plant Rhynchostylis gigantea (Lindl.) Ridl. of the family Orchidaceae. This page was last edited on 20 December 2018, at 18:35.